We've been using bridges to replace missing teeth for decades. Now, recently-developed implant-supported bridges are even more dependable, promising greater durability and less interference with remaining natural teeth. But just like other restorations, you'll need to keep implant bridges clean to ensure their longevity. Although both the bridge and implants are impervious to disease, the supporting gums and bone aren't. If they become infected, they can break down and your restoration will fail. Cleaning an implant-supported bridge includes flossing around each of the implants to remove dental plaque, a thin film of food particles and bacteria most responsible for dental disease. 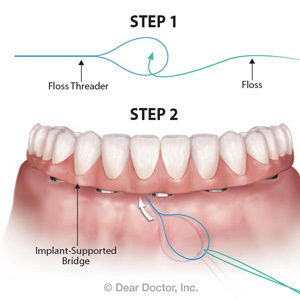 To perform this task, you'll have to pass the floss between the bridge and gums to access the sides of each implant. To help make it easier, you can use a tool like a floss threader, a thin, shaft-like device with a loop on one end and a needle-like point on the other. You'll first thread about 18" of floss through the end and then pass the threader between the bridge and gums with the sharp end toward the tongue. With the threader completely through, you'll then wrap the floss around your fingers as with regular flossing and move the floss up and down each side of the implants you can access. You'll then pull the floss out, reload the threader and move to the next section, repeating this process until you've flossed each side of each implant. You can also use pre-cut floss with a stiffened end to thread between the bridge and gums or an interproximal brush with a thin bristled head that can reach underneath the bridge. And you might consider using an oral irrigator, a pump device that sprays a stream of pressurized water to remove and flush away plaque around implants. To round out your hygiene efforts, be sure you visit your dentist at least twice a year for dental cleanings. Your dentist can also advise you and give you training on keeping your implants clear of disease-causing plaque. Cleaning around your implants will help ensure your restoration will last.